With reference to your query about countries which do not demonetise their old currency there was a BBC story about Germany recently. Although the German Mark is not legal tender it still can be changed to euros. Germans are still holding on to billions of Deutschmarks, nearly eight years after the currency was phased out, Germany's central bank says. The Bundesbank has given an overall figure of 13.6bn Deutschmarks - worth about 7bn euros (£6.3bn). The Bundesbank has set no deadline for exchanging Deutschmarks for euros and no fee is levied when Germans do so. 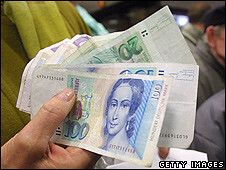 Nearly DM160m was exchanged for euros in 2009, said Bundesbank spokeswoman Adelheid Sailer-Schuster. The Deutschmark ceased to be legal tender on 1 March 2002. But there were many complaints at the time that traders were using the switch from Deutschmarks to disguise price mark-ups. The Bank of England will still redeem any of their obsolete notes, even though they have lost their legal tender status in commerce. In practice, many London banks will also exchange obsolete BoE notes that can no longer be used in trade. No one-yen note of the Bank of Japan has ever been demonetized. That is why one-yen notes illustrated in books have specimen markings imposed on them, no matter their age. Pre-1946 Bank of Japan notes are no longer exchangeable, and no specimen markings are needed on them when published. Most writings on banknotes by bank tellers are numerals indicating the amount of money in the stack, when less than a full strap is involved (50 or 100 notes). They write the numbers on the watermark window, a convenient blank space that begs to be "scribbled" on.